Passengers said they did not think they would make it off a disabled cruise ship that was rocked by a storm off the coast of Norway. 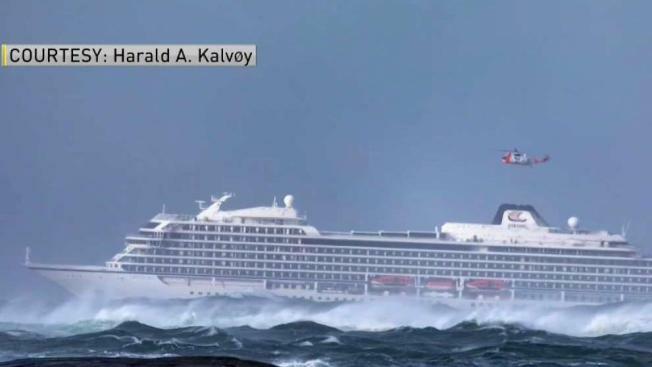 Rescuers worked to evacuate 1,300 passengers and crew by helicopter from the Viking Sky, which had encountered bad weather Saturday. The ship issued a mayday call after engine problems caused it to start drifting toward the rocky shore, according to VG, a Norwegian newspaper. "My friend and I, and a lot of other people, were completely underwater for a minute," recalled Dr. Anne Marie Decker of Rye, New Hampshire. "We thought that was it." "We were wet. We were soaked. A number of us were in that area where the window broke and we were soaked," said Deborah Kellett of Boston. Police in the western county of Moere og Romsdal said the crew, fearing the ship would run aground, managed to anchor in Hustadsvika Bay, between the Norwegian cities of Alesund and Trondheim, so the evacuations could take place. Rescue teams with helicopters and boats were sent to evacuate the cruise ship under extremely difficult circumstances. Norwegian media reported gusts up to 38 knots (43 mph) and waves over 26 feet in an area known for its rough, frigid waters. Decker said some of the people evacuated were hurt. "I know there is a lot of blood all over," she said. "There are a lot of cuts from things falling. All the wine bottles are on the ground. A lot of people got hurt that way."